Tamara just put up our photos of puffins and an article with 25 facts about puffins on the Quillcards Blog! Will go there and read — I love all things puffin! This picture is so beautiful …they’re the cutest birds! 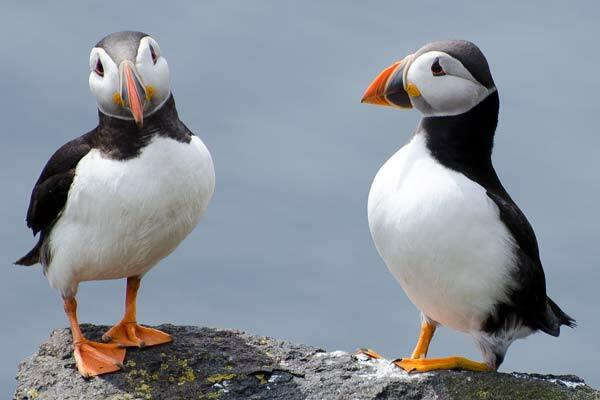 It’s no wonder that puffins steal the hearts of everyone who sees them. A couple of years ago we went on a sea trip to the waters around Bempton Cliffs in East Yorkshire in England, hoping to see puffins. The weather was bad and the boat heaved and everyone looked green. And there were no puffins. Then we spied one lone puffin in the water and everyone went ‘Awww’. But the thing was – you know how people say things like that ‘communally’ – like they all know they are all going to say it? Well, this time it was a chorus of private ‘awws’ (Tamara and I included, of course) and it just made me so happy to hear that chorus of awwwwws.